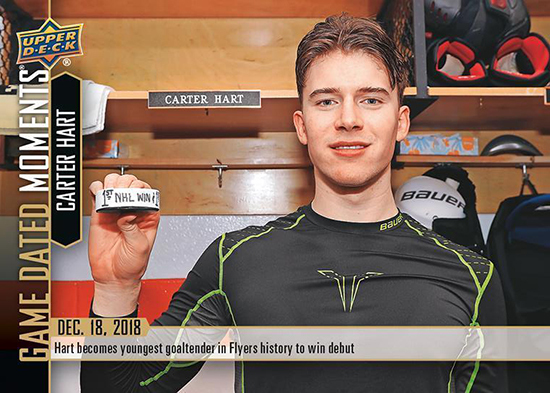 The Philadelphia Flyers have had some solid rookie goaltenders on their roster over the years and Carter Hart is the latest freshman netminder to make a splash with fans in the “City of Brotherly Love” and beyond. Looking back, the team has had great performances out of debuting goalies dating back to Doug Favell during their inaugural season of 1967-68. In 1979-80, Pete Peeters helped take the club to the Stanley Cup Final and Pelle Lindbergh became a part of the NHL’s first All-Rookie Team three years later. Ron Hextall won the Vezina Trophy and backstopped the team to Game 7 of the Stanley Cup Final in 1986-87 and other goalies like Roman Cechmanek and Sergei Bobrovsky had solid rookie campaigns. Regarded as the top goaltending prospect in the Flyers organization since being drafted, Hart has proven to be a strong addition to the club’s roster during a challenging 2018-19 campaign. His performance since the beginning of January earned him NHL Rookie of the Month honors and there are plenty of reasons to start collecting him now. 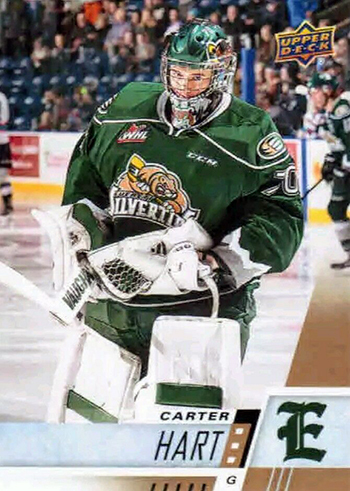 Carter Hart’s Game-Dated Moments card is the first licensed NHL trading card for this young star. Before the 2018-19 season began, Hart was invited to participate in the 2018 NHLPA Rookie Showcase. While getting a chance to meet some of his peers for the first time and catch up with old rivals, he posed for some of his upcoming Upper Deck NHL trading cards in anticipation for his debut with the Flyers. 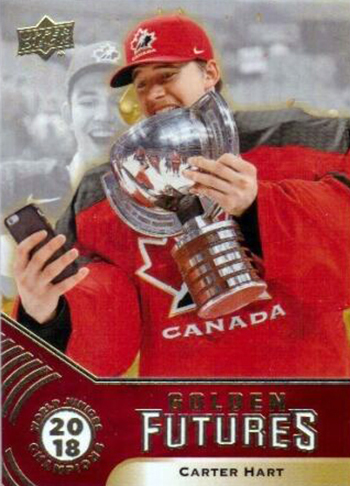 Additionally, he made a Facebook Live appearance on Upper Deck’s page where he cracked open a tin of 2017-18 NHL Premier and he was impressed by the cards he pulled – including a dual autographed booklet featuring Bobby Orr and Phil Esposito and a quad jersey card depicting some of his favorite goalies. Hart was able to start 2018-19 in the AHL with the Lehigh Valley Phantoms and earned a victory during his professional debut against the Bridgeport Sound Tigers on October 6, 2018. Leading up to his promotion to the Flyers roster, he went 9-5-2 and even had a shutout victory over the Hershey Bears on December 7. On December 18, 2018, Hart was pressed into duty as the Flyers were in the midst of a goaltending crisis. The franchise’s future between the pipes had to make an early arrival and delivered with a 20-save effort as Philadelphia defeated the Detroit Red Wings. He followed that up with a victory over the Nashville Predators two days later. After some struggles in the games that followed, Hart turned things around with a triumph over the Minnesota Wild on January 14, 2019 – kicking off a streak of six consecutive victories. His next three appearances included wins over tough opponents in the Boston Bruins, Montreal Canadiens, and Winnipeg Jets. Hart’s last contest in the month of January was a rematch with the Bruins and he prevailed in overtime thanks to an overtime goal from teammate Travis Sanheim. As a result, he became the first goalie under the age of 21 to post a five-game winning streak since Carey Price accomplished the feat back in 2007-08 (and the 10th to do so in NHL history). Over the course of January, he went 6-2-1 with a solid 2.33 goals-against average and outdistanced competitors like Jordan Binnington of the St. Louis Blues, Buffalo Sabres defender Rasmus Dahlin, and Vancouver Canucks sensation Elias Pettersson for NHL Rookie of the Month honors. As the calendar moved into February, Hart’s momentum continued as he earned a sixth straight victory. This time, he proved resilient in the face of 44 shots from the Edmonton Oilers and kept the Flyers in the game before they could prevail in overtime thanks to a goal from Nolan Patrick which gave Philadelphia a 5-4 edge. In the years leading up to his memorable NHL start, Hart enjoyed an incredible junior hockey career as a member of the Everett Silvertips. A steal during the eighth round (158th overall) of the 2013 WHL Bantam Draft, he was coming off an Alberta Cup championship with his hometown Sherwood Park Flyers. In preparation for major junior action, he was promoted to the Minor Midget Sherwood Park Quires. He managed to not only lead the AMMHL with a 1.93 goals-against average, but was also named the loop’s Top Goaltender and Most Valuable Player. 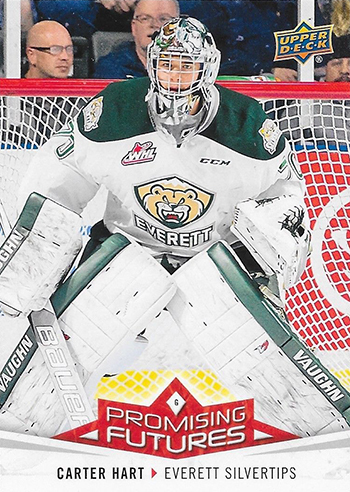 On February 16, 2014, Hart was able to make his debut with the Silvertips and sustained a 20-save loss to the Spokane Chiefs. He appeared in one more game a month later, but earned a full-time backup role with the club for the 2014-15 campaign. His 2.29 goals-against average was tops in the league despite limited action and pro scouts were starting to take notice. There was no such thing as a sophomore slump for Hart in 2015-16 as he proved to be the Top Goaltender for both the WHL and CHL in preparation for the 2016 NHL Draft. He was also chosen to appear in the CHL/NHL Top Prospects Game and the Canada/Russia Super Series. The Flyers chose Hart with the 48th overall pick in the 2016 NHL Draft and the club took its time in ensuring that he would continue to develop into a solid pro goalie. He returned to Everett for 2016-17 and won the Del Wilson Trophy as the WHL’s best goalie for the second straight time thanks to topping his peers in goals-against average and save percentage. 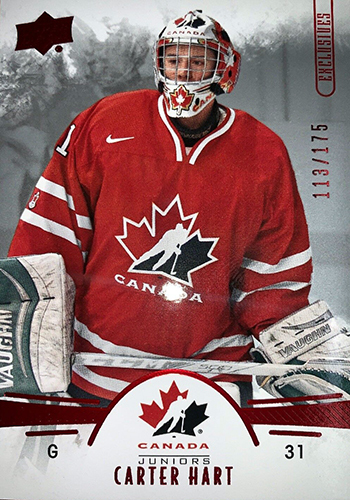 Additionally, he won silver with Canada at 2017 IIHF World Junior Championship. 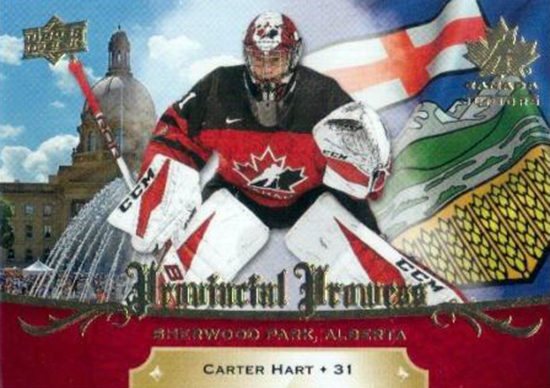 Hart’s final WHL season had Flyers fans excited for the future as he paced his peers with a stingy 1.60 goals-against average and .947 save percentage en route to a third straight nod for Top Goaltender before being named the best in the CHL for the second time in three seasons. 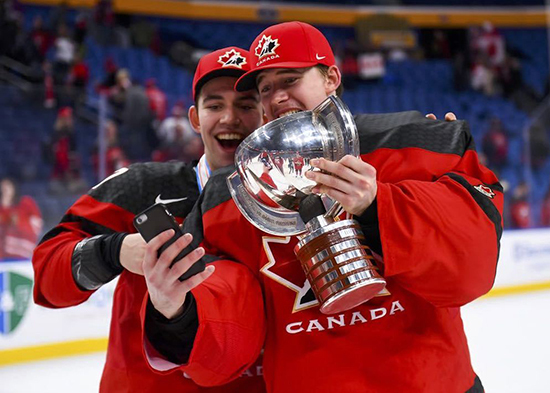 On top of that, he was also the winner of the Four Broncos Trophy as the WHL’s Most Valuable Player and helped Canada to a gold medal victory at the 2018 IIHF World Junior Championship. 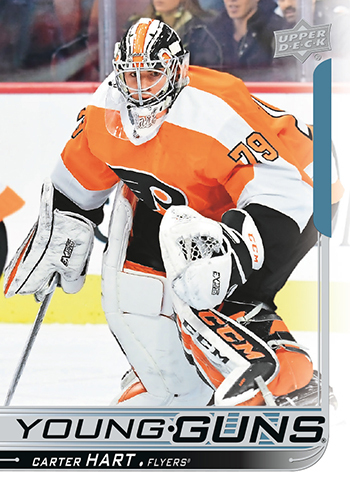 Collectors will not need to wait long for the first cards of Hart in a Flyers uniform as his Young Guns rookie card drops inside packs of 2018-19 NHL® Upper Deck Series Two in February. Subsequent releases will also give collectors a shot at early cards of Philadelphia’s new net hope, but there are already some solid options on the market for those wanting to start a player collection as well. 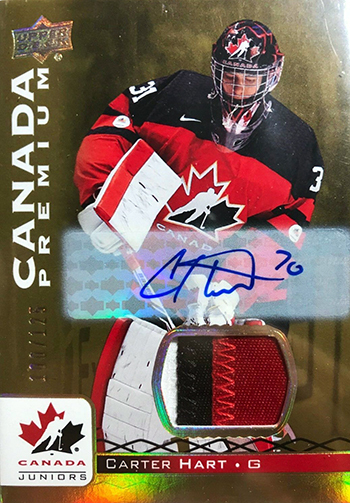 In 2016-17 Upper Deck Team Canada Juniors, Hart is featured in his national colors and the basic card has several parallels. 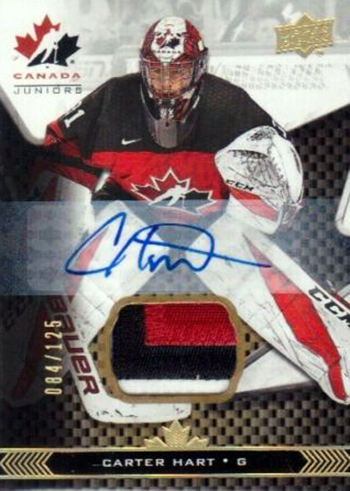 The next edition of Team Canada Juniors was loaded up with plenty of autograph and memorabilia cards as well. Those wanting cards showing him during his days with the Everett Silvertips should consider 2017-18 Upper Deck CHL and there are some intriguing inserts to track down. Stephen Laroche has been actively involved in the hockey collectibles industry in a variety of roles for nearly 20 years. In the past, he has been a writer and editor with Beckett Media and SLAM! Collectibles in addition to working as a trading card company executive and consultant. He is available for freelance work and can be contacted at stephenalaroche@gmail.com.